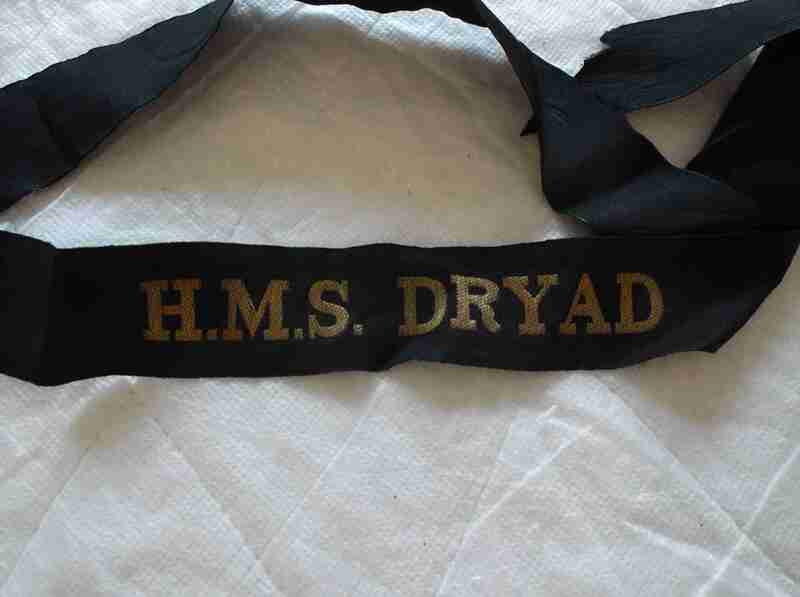 DESCRIPTION -- Cap tally from the Royal Naval vessel HMS Dryad and it is in a great condition. DESCRIPTION -- Cap tally from the Royal Naval Engineering training facility in Gosport, England and it is in a great condition. DESCRIPTION -- Cap Tally from the Vessel HMS Neptune which is in a very good condition and is an as used in service item (click on the view link or on the picture for a closer look at this item). HISTORY -- HMS Neptune was a Leander class light cruiser which served with the Royal Navy of the United Kingdom during World War II. The Neptune was the fourth ship of its class and was the ninth Royal Navy vessel to carry the name Neptune. Built by Portsmouth Dockyard, the vessel was laid down 24 September 1931, launched 31 January 1933, and commissioned into the Royal Navy on 12 February 1934 with pennant number 20. DESCRIPTION -- Cap Tally from the German Vessel Minensucher Geschwader 7 which is in a very good condition and is an as used in service item. DESCRIPTION -- Cap Tally from the Vessel RFA Fort Austin which is in a very good condition and is an as used in service item (click on the view link or on the picture for a closer look at this item). HISTORY -- RFA Fort Austin (A386) is a fleet stores ship of the Royal Fleet Auxiliary. Fort Austin was laid down at Scott Lithgow in 1975, launched in 1978 and commissioned in 1979. These type of ships were designed to carry a wide range of stores to support other ships; ammunition, food, explosives. They have extensive aviation facilities, with two flight decks, one to the stern and one spot on top of the hangar, up to four Sea Kings can be stored in the large hangar. These ships also have the capability to replenish ships at sea, via six RAS points. When the Falklands War began, the ship headed south, taking part in the landings at San Carlos Water as an ammunition ship. DESCRIPTION -- Cap Tally from the Portuguese naval vessel NRP Corvo and it is in a great condition. DESCRIPTION -- Pair of original service Cap Tally's showing on one HMS and on the other RFA. Both are in a very good condition and are as used items (click on the view link or on the picture for a closer look at this item). DESCRIPTION -- Cap tally from the Royal Naval vessel HMS Undaunted which is original and in a great condition. HISTORY -- HMS Undaunted (R53) was an U-class destroyer of the British Royal Navy that saw service during World War II. She was later converted into a Type 15 fast anti-submarine frigate, with the new pennant number F53. HMS Undaunted had a long, distinguished and industrious career, which started soon after her launching and acceptance into the Fleet in 1944. DESCRIPTION -- Cap tally from the vessel TSS Uganda which is original and in a great condition.